Tabula Rasa: Happy Birthday, Blog! 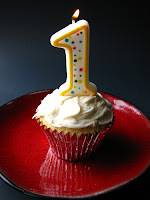 After 82 posts, 591 comments, 70 followers and 13,125 hits - today my blog turned one. All the numbers don't really matter to me - they just shocked the hell out of me is all! From silly jokes and making fun of everything (and everyone! ), to talking about cats, doodling and writing incessantly about books - this blog has been through a LOT. It's been a great year - what with bugging my friends all the time about my latest blog post and wondering what to blog about next during class! "Tabula Rasa" has been with me through good and bad - mostly good! Thanks to the people who made my blog happen and my (if any) patient readers! This calls for a huge celebration! Shalmali - Lol :D Tabby is enough!! Hey! One year gone by! Happy Birthday To peskypiksipesternomi. On this occasion, may I ask - What does "Tabula Rasa mean?" and why the peculiar blog address? Thanks :) Haha, you wouldn't be the first to ask. I am CRAZY about Harry Potter and "Peskypiksi pesternomi" is a spell from the Chamber of Secrets. And I re-read the book (for the millionth time) around the time I created the blog, so that might have something to do with it. "Tabula Rasa" isn't as random. The literal translation is: clean slate. Like a new beginning. But to be precise- it is the human mind when we are born - without any of the impressions gained from experience! Hmmm... deep. Why didn't I remember the spell? Maybe because I read the 2nd book 4 years back. But I like the meaning of Tabula Rasa.